Wednesday, January 20, 2010 marks the official one-year anniversary of Barack Obama's presidency. It's amazing how much has transpired in such a relatively short amount of time. When we think about where we were a year ago and where we are today, the thought conjures up much controversy and emotion, especially within the Black community. We've been no stranger to these debates here at The Urban Politico as of late, and therefore think it is only fitting that we pose the question: Considering EVERYTHING that has happened from the Inauguration until today, how would you grade Obama's first year as President? This same question was recently discussed on BlogTalkRadio (big ups to brother Max Reddick for inviting us, check out his blog HERE) where, more or less, the general sentiments expressed were different renditions of disappointment regarding Obama's first year performance, ranging from (i) his lack of attention to the Black community to (ii) his general lack of aggression when faced with opposition to (iii) his apparent adoption of Republican/Bush policies. Before I jump into my Report Card for Obama, I want to set a few ground rules that I think are important in judging the performance of our first African-American President. First and foremost, when judging Obama's performance on his campaign promises, we have to make sure we know what those promises actually were. During the BlogTalkRadio discussion, one sister stated she was disappointed that Barack Obama had not kept his word to bring the troops out of Afghanistan. While I certainly co-sign with the folks who are against the war in Afghanistan (I personally did not find Obama's "War in Afghanistan" speech persuasive), to say that Obama broke his campaign promise to bring troops out of Afghanistan is flat out incorrect. He campaigned to bring troops out of IRAQ, not Afghanistan (a promise that he has kept, BTW). In fact, during the 2008 campaign, Obama clearly stated in the King's plain English for all to hear that he would specifically increase America's military presence in Afghanistan. So when I hear my people say they think Obama broke a campaign promise by sending more troops to Afghanistan, I have to wonder if they were really paying attention during the campaign. As a final word on this point, you can literally see Obama's campaign promise check list here on Politifact.org where it is showing that, of his 502 campaign promises, he currently has fulfilled 91, has compromised on 33, and has over half of them in-the-works. Secondly, I think it's important to know what a President can and can't do. I know the law is boring to most people and we'd rather not be bogged down with all the technical mumbo jumbo on separation of powers, equal protection, and all that jazz, however, at the very least we should have an elementary, Sarah Palin-ish, 7th-grade civics level of understanding with respect to what a President can and can't do. I heard one cat say during the campaign here in NYC that he was glad Obama was, at the time, going to be President because finally the pot holes on his block (a black neighborhood) were going to get fixed. C'mon my people, Imma need us to do just a little bit better than that. Although I'm willing to admit that some of my negatives are merely my personal beefs with Obama's style, the critiques on the HBCU funding, Gitmo and Afghanistan are undeniably substantive complaints against Obama's performance as President. So that's 9 solid positives, and 3 solid negatives for a total of 12 items. 9 out of 12 = 75% so on the raw math I have to give him a "C." However, I'm willing to spot the brother a little extra credit since I recognize that Gitmo and Afghanistan are major problems inherited from the previous administration. So that bumps him up to an overall grade of "B-." So how about it? 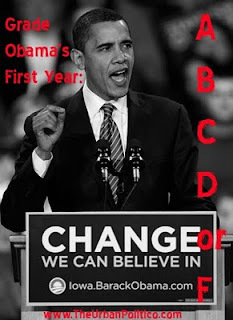 What Grade do you give Obama's First Year? 32% of you felt Obama deserved some level of an "A"
41% of you felt Obama deserved some level of a "B"
14% of you felt Obama deserved some level of a "C"
7% of you felt Obama deserved some level of a "D"
8% of you gave him an "F"
So it looks like the bulk of you fell into the "B" category, which is probably fair considering that is the range where Obama placed his own first year performance. It should also be noted that the number of voters for "A", particularly "A+" increased significantly in the days after the SOTU and last Friday's meeting with House Republicans where Obama single handedly dismantled a room full of nearly 200 of his harshest critics. So although technically these last minute events are not attributable to Obama's "first year," it seems many of you felt the need to express your approval of the President's recent performance nonetheless.